For the second consecutive month, residential real estate prices across Brazil remained stable, but only four cities outpaced April's inflation rate. 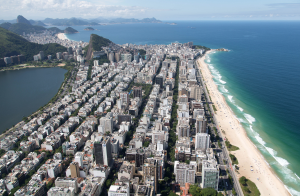 RIO DE JANEIRO, BRAZIL – According to the latest FipeZAP Index, which tracks residential real estate sale prices in Brazil’s twenty biggest cities, prices remained relatively stable in April, registering a marginal decline of 0.01 percent compared to March. Rio’s upscale neighborhoods of Leblon and Ipanema still have the highest residential real estate prices in Brazil, photo by Fernando Maia/RioTur. The slight decline in April represents the second straight month of relative stability in the country’s volatile residential real estate market. However, real estate owners and investors have reason to remain cautious. Only four of the twenty cities surveyed outpaced April’s expected inflation rate of 0.20 percent, as measured by the IPCA/IBGE (National Consumer Price Index/Brazilian Institute of Geography and Statistics): Vila Velha (0.40 percent), Florianópolis (0.36 percent), Santo André (0.29 percent), and São Paulo (0.27 percent). In addition, of the twenty cities surveyed, nine showed nominal declines in residential real estate prices from March to April, with the biggest drops seen in Fortaleza (-0.54 percent), Rio de Janeiro (-0.40 percent), Niterói (-0.36 percent) and Recife (-0.29 percent). In April, the average price per square meter among the twenty cities surveyed was R$7,696. Rio de Janeiro once again led the way with the most expensive residential real estate sale prices, with an average price of R$10,180 per square meter. Trailing Rio de Janeiro was Brazil’s financial capital, São Paulo with an average price per square meter of R$8,680, followed by Distrito Federal at R$8,445 per square meter. The cities with the lowest average residential real estate value per square meter were Vila Velha at R$4,632, Goiânia at R$4,106 and Contagem at R$3,519. In April, São Paulo’s neighborhood of Vila Nova Conceição had the city’s most expensive square meter, photo by mivomitosullescarpe/Flickr Creative Commons License. Unsurprisingly, the three most expensive neighborhoods in the survey were in the Cidade Maravilhosa. Rio’s upscale neighborhood of Leblon had the honor of being Brazil’s most expensive neighborhood, with real estate sale prices clocking in at R$21,541 per square meter. Not too far behind was trendy Ipanema, at R$20,175 and Lagoa at R$17,903. In São Paulo, Vila Nova Conceição had the city’s most expensive real estate sale prices, at R$16,564 per square meter. 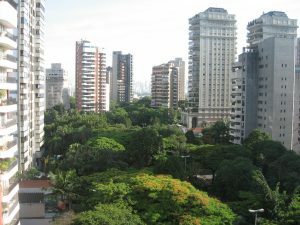 Next was the neighborhood of Jardim Europa at R$15,646, followed by Jardim Paulistano, at R$14,050 per square meter. When drawn out over the last twelve months, six of the twenty cities that were surveyed showed nominal declines in residential sales prices: Goiânia (-3.50 percent), Nitéroi (-2.48 percent), Rio de Janeiro (-2.70 percent), Fortaleza (-1.55 percent), Distrito Federal (- 1.18 percent), and Recife (-0.22 percent). Taking into account the accumulated rate of inflation of 4.14 percent for the twelve month period, only one city, Belo Horizonte showed a higher variation against inflation, with prices increasing 8 percent over those twelve months. Previous articleOpinion: The End of Brazil’s Lava Jato? Crazy prices for a 3rd world failed state.